The City of Pisa played an important role in Italy’s history. As a vital seaport and a major center of trade, many people visited the city. In the early days, Pisa was a popular resting place for pilgrims from Europe on their way to Jerusalem. The military fleet of Pisa was most successful. In 871 the fleet helped defend the Salerno from attackers, and it was Pisans that forced the Arab troops from the islands of Corsica and Sardinia in 1015. As their riches and influence increased, the city of Pisa, Italy, became more and more powerful. The decline of Pisa began in 1284 when Genoa defeated the Pisans in battle. The islands controlled by Pisa were lost and the influence began to decline. 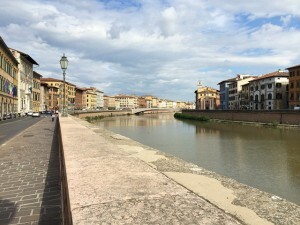 By the 15th century the Arno River had become so filled with silt that it completely cut off Pisa from the sea. This marked the end of Pisa as a useful port and the end of its wealth and power. 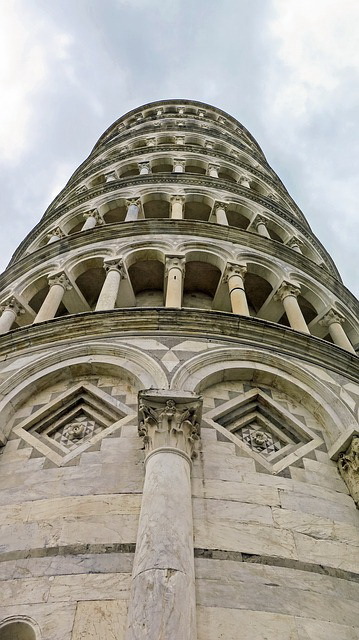 In 1174, engineer Bonnano Pisano laid a marble foundation large enough to park about 16 Ferrari 328s in and started building the campanile for the cathedral and baptistry of Pisa. The Romanesque Tower of Pisa, comprising 14,000 tonnes of white marble, was completed 176 years later – but it was also embarrassingly crooked. Because there was a lot of water under the ground in this area, Bonnano was able to place the foundation only about 10 feet down into the ground. As the first story of the tower was completed, the south side began to sink. The builders tried to make it look better by building the columns and arches on the south side about an inch taller than those on the north side. However by the time they got to the fourth story, they had to make the southern columns 2 inches taller than the northern ones. The tower just continued to lean, and because of the difficulties the construction was stopped. In 1234, the architect Benenato discovered that the tower was leaning even more. Now the south side of the fourth story was a full 6 inches shorter than the north side. He added a fifth story, again making the south columns taller than the north ones. After adding that one story, Benenato gave up, and again construction on the tower stopped. Almost thirty years later, in 1260, William of Innsbruck added the sixth and seventh stories to the Tower of Pisa. In 1350 Tommaso Pisano started work on the eighth story of the tower, the bell chamber. He found that the tower was still sinking, and so he made the spiral stairs inside the tower and the wall of the bell chamber higher on the south side than on the north. The tower was finally completed in 1372, almost 200 years after it was begun, and it was still leaning. See also Historical Facts about Tower of Pisa.